Jia-mo Chen holds a MM degree from San Francisco Conservatory of Music. He has performed in many concerts as a soloist, chamber musician, and orchestral player in different venues throughout Taiwan, his hometown, and North America. Chen has performed with North State Symphony, California State University Sacramento Orchestra, where he served as principal cellist for 2 years, San Francisco Conservatory Orchestra, where he served as principal cellist for one year, and was a regular member of Civic Orchestra of Chicago with which he played under conductors such as Esa-Pekka Salonen, Bernard Haitink, and Riccardo Muti. Right now he is a member of Stockton Symphony. Besides performing, Chen enjoys teaching the art of music. 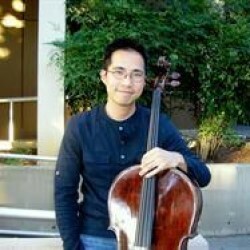 He has been an apprentice teacher with the Sacramento State String Project under the supervision of Suzuki Master Teacher Judy Weigert Bossuat, who is the cello instructor for Music for Kids, a non-profit music program designed for low income families in Chicago area. He is now the cello instructor of the Pacific Institute of Music in Folsom, CA. "